Jati Luwih locates 2 hours by car from Nusa Dua area. It is in Tabanan of the central east Bali. As the name means “really superb,” it is the magnificent view of broad rice terrace! 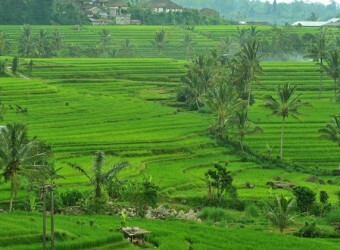 Jatiluwih is quiet and simple countryside. It must be the good memory that the soft curved line rice terrace view and the long line foggy mountain view. There is the good restaurant near there. It`s very beautiful. I enjoyed a great time at a café on the hill in this beautiful rice terrace. I had tea time while overlooking the superb view of rice terrace!! I recommend you to go to Jatiluwih when you go to Bali.